Preface: Cantillon is one the few remaining (and probably the most well-known) traditional brewers of the spontaneously fermented lambic beer. Lambic beer is native to the Senne river valley in the area of Belgium including and around Brussels. The brewery is owned and run by the Cantillon/Van Roy families, with the brewing traditions passed down to each new generation of brewers. Jean Van Roy is currently the brewer at Cantillon, though he is now beginning to teach his son to brew. Each March and November the brewery invites the public to observe one of their brew days. On any other normal day of the year (excepting Sundays) the brewery/tasting room is open for visitors to take a self-guided tour and try the beers. But on the public brewing days you get a rare chance to see one of the more traditional brewing methods in action. In this first and rather long post, I'll run through the Cantillon brew day that I observed. In part 2 (to come later) I'll add a bit of extra info on beers I tried while there, info on unreleased Cantillon projects still in fermentation and on ideas that Jean is developing, lasting impressions from the brew day and maybe some extra pictures. Brew Day: As I opened to door to the brewery just before 7:30 on a cold Brussels morning I was struck by a warm humid wave, sticky and with the tannin of oak and the citric acidity and funk of a lambic. As I stepped inside I saw this was coming from the barrel cleaning already well underway. Empty barrels which previously held lambic are blasted with hot water to rinse out the trub (yeast and other sediment which has settled out from the beer), filling the entrance way with steam and the smell of the lambic the barrels once held. After the inside of each barrels is thoroughly rinsed, the barrels are placed into what has fittingly been described as a medieval torture device by Vinnie from Russian river in his 2007 NHC talk: chains are placed into the barrel, which is still partially full of hot water, and the barrel is then spun around to more thoroughly clean the inside of the barrel. This barrel cleaning would continue throughout most of the day, and I continued into the brewery (through the barrel steam permeating most of the ground floor) to drop my bag, grab a breakfast croissant and see the brew in action. I knew I could stop back later to get my fill of lambic-scented steam pouring out of freshly emptied barrels. Cantillon's belt-driven pump recirculating the mash. The wood-lined cast iron mash tun, kettle 1 (behind) and kettle 2 (right). Unfortunately I missed the first half hour or so of the brew (mashing started around 7:00) on account of the 5 am bus that I wanted to catch being a couple of minutes early. So I had to wait another hour for the next bus (I was staying a bit outside Brussels and transport into the city was limited at this time of day). I arrived part way through the mashing, and so my information on exact mash temperatures and rest times is a bit lacking. I was filled in by some fellow homebrewers and lambic beer enthusiasts on what I missed. The first mash step (48 C I was told) had been completed and now we were resting at 66 C. And the first pull of wort had been transferred into the holding vessel/smaller boil kettle, following turbid mashing procedures. Looking at my notes and comparing to other reports of Cantillon mash procedures, I seem to be missing a rather short rest at ~58 C.
Quick break - If you are unfamiliar with a turbid mash, it is procedure for very efficiently (in the sense of extract but not time) extracting fermentable sugars and starches from the grains used in brewing. It is significantly more complicated than a normal brewing mash and it preserves significantly more unconverted starch than modern mashing procedures. This starch is unfermentable to the Saccharomyces strains typical to brewing but the additional yeasts (such as Brettanomyces) and bacteria (mainly Pediococcus and some Lactobacillus) can access these starches. There’s an interesting history to turbid mashing with influence from the methods of taxing brewers in Belgium used over time. In brief, turbid mashing involves pulling liquid portions of the mash to be heated in a separate vessel, stopping enzymatic activity and preserving unconverted starch from the grain. These removed portions of mash liquid are replaced by hot water to increase the temperature of the mash to the next rest temperature, which is selected based off of the desired enzymatic activity. If you’re looking for more information on turbid mashing methodogy and history, I’d recommend the book Wild Brews (a really solid resource for anyone interested in Belgian sour beers), articles from past issues Brew Your Own magazine and other bloggers such as the Mad Fermentationist and Funk Factory. Alright, back to the brew day. Bags around the brewery suggested that Cantillon was using organic Dingemans pils malt for this batch, though I think I've seen previously Weyermann malt bags there as well. The grist was 800 kg barley malt and 400 kg unmalted wheat and had been milled the day before. Cantillon operates with a mash tun, a hot liquor tank, and two boil kettles. One kettle is larger and serves as the main boil kettle and the second is smaller and serves as the pulled mash liquor holding/heating tank as well as the supplementary boil kettle. After a 15 minute rest at 72 C, Jean started the vorlauf (draining and recirculating the mash liquor to get clear mash runnings) and transferred the early runnings to the main boil kettle. Adding the pulled liquor from kettle 2 back to the mash tun. The first mash runnings went into the main boil kettle. Unlike in typical mashes, these runnings didn't taste all that sweet. Perhaps this is because mash liquor is being removed to the second kettle and replaced by water. The first runnings were hazy and tasted very starchy and a bit like hay. The tannins and unconverted starch countered the sweetness and gave much more of a dry taste than I expected. With the first runnings drained, the mash liquor which had previously been moved to kettle 2 was added back to mash tun and left to rest with the grain for 15 minutes before also being drained into the main kettle. These runnings were more clear (perhaps from protein precipitation during heating) and were sweeter than the 1st runnings, tasting closer to standard mash runnings. Spent grain in the Cantillon mash tun. Sparging (rinsing the grain with water) was carried out with 88 C water. The mash runnings in the first (main) boil kettle reached a boil before the the kettle was full. At 11:30 the first kettle was full and the mash runnings were directed to kettle 2. At about 12:30 all of the mash running were collected. The remaining spent grain had even less flavor than spent grain from a typical brew. I expected it to not have much taste but I was surprised by how little was left in the grain after the mash. I didn't get the complete pre-boil volume but at 13:00 (when kettle 1 had been boiling for aver 1.5 hrs) there was about 6038L in the main boil kettle and 2545 L in the secondary kettle (the sight glasses on the kettles at Cantillon are in cm, with a spreadsheet to give volume from the height of wort). Hops being added to the main boil kettle. The boil at Cantillon lasts 3.5-4.5 hours, with roughly 25% of the pre-boil volume evaporation during the boil. The target final wort volume was around 7000 L. Both boil kettles are hopped with aged hops, typical of lambic production but not in more standard brewing. This brew used 2010 Tettnang whole hops, but bales of 2009 Saaz and 2011 Halltertau are also waiting in Cantillon's attic. 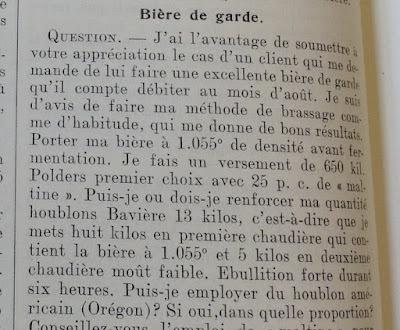 Jean's son weighed out 15 kilos - as Jean said, he must learn to brew lambic. And as Jean jokingly suggested throughout the day, learning at this point mainly involved the generally less desirable but definitely necessary brewing tasks such as weighing out ingredients and cleaning. It was pretty cool to see the active training of the next generation potential Cantillon brewer, even if he did get stuck with all the not so exciting tasks at this stage. I'm not sure if the entirety of this 15 kilos was added to the first (and main) boil kettle or if it was split between the two. If it is the entire hopping amount, this is in a bit of disagreement with reports of around 5 grams of hops added per liter of wort (which would suggest 35 kilos for a 7000 L brew day). Perhaps I am off with the 7000 L final wort volume, but it seems to match the ~8600 L mid boil volume I saw. So maybe another amount of hops was weighed out at a different time for the second kettle and/or the hopping is not quite 5 g/L. I guess I'll have to go back with some more questions for next time. It's hard work, but someone has to do it. An interesting feature of the boil kettles at Cantillon are large internal copper loops (I estimate the larger of these is on the order of 10"/25 cm in diameter) and a propeller for mixing. I'm not sure what these are for. One (the larger outer ring) seems to line up with the inlet/outlet for the kettle (outside pictured above) but I'm not sure about the inside ring, which connects to a point higher on the side of the kettle. This must be for steam heating, or something like this. The first bit of hot wort reaches the coolship. Wort cooling in Cantillon's coolship. At 15:10 the boiling was done and wort was transferred to the coolship, ending the brew day. The coolship is a large shallow copper tray in the top floor of the brewery which holds the hot wort as the wort cools overnight. The coolship room has slats at the wall which are opened, allowing the evening air to enter and cool the wort. The weather in Brussels this weekend was reasonably cooperative, raining at night time but mostly not during the day. Overall though, Brussels had been very wet over the preceding weeks. To a lambic brewer, this could be influential/of concern for a couple reasons. First, higher humidity outside means less evaporation during cooling, which means a slightly lower strength wort at the start of fermentation. I'm not sure how significant an effect this has, but I've heard other lambic brewers discuss how this can influence their lambic. Additionally the native micro-organisms in the air can be stripped out, influencing the spontaneous inoculation. Fortunately for breweries such as Cantillon that have been active for some time, brewhouse-resident microbes play a dominant role in spontaneous fermentation (Cantillon has been active in its building for over 100 years, but resident populations of microbes are observed in much younger breweries). So it is likely that the native air-born population of yeast and bacteria play a much more minor role and the terroir of individual lambic breweries is more driven by the yeast and bacteria living on ceiling tiles, joists, walls and inside the barrels in which the wort ferments. This brewhouse population may have arrived over years from the surrounding environment, among other sources, but now it is established within the brewery. This brewhouse-resident microbial community inoculates the wort as it cools. Consequently, there is a belief that lambic brewers hold (and rightfully so) that building renovations and/or changing location will alter the character of the beer. As I mentioned above, this is the final step (excepting cleaning) for the brewday and the wort will sit in this coolship overnight before being transferred to barrels for fermentation. The coolship, with open wall slats allowing the evening air of Brussels in to cool the wort. Thanks for reading and hopefully you learned something about lambic and/or Cantillon's brew process. Look for part 2 (info on beers I tried while there, unreleased Cantillon projects still in fermentation and ideas that Jean is developing, and lasting impressions from the brewday and more pictures) in the coming week. Postscript: I've tried to write this to a more general audience and define some brewing terms that would be familiar to many brewers but not necessarily everyone else. And I tried to strike a balance between people well versed in lambic brewing and those that did not previously know of the style. I talk about Cantillon and other lambic brewers and blenders a bit more in this 2016 post about visiting lambic producers.